I’m a web designer and developer with 14 years experience of developing custom websites. I worked for a number of companies in London & Bristol as a Lead Developer prior to setting up to provide freelance services. I work closely with you throughout the process, from initial contact to delivery. I am also on hand for help & advice after the task is delivered. Every client and task is unique. I listen to you, what you need and how your business works. This is what makes me a good choice for your project. Because of how I work & communicate, I have many clients who have been returning to me for years for further projects. * Genesis Cases – A custom woocommerce design & theme development project. Extremely responsive and professional. Went the extra mile to achieve a successful outcome. Highly recommended! First time using Codeable. Was blown away by the ease of use and customer service. Hannah was quick, friendly and a pleasure to work with! Hannah King did a great job. She asked the right questions and was very fast. I would highly recommend her. She has completed everything requested for a very good price. Very professional and efficient. very fast and good work! Thank you very much! Hannah was amazing! She coded Sensei and Divi together so they worked together without any formatting errors whatsoever. 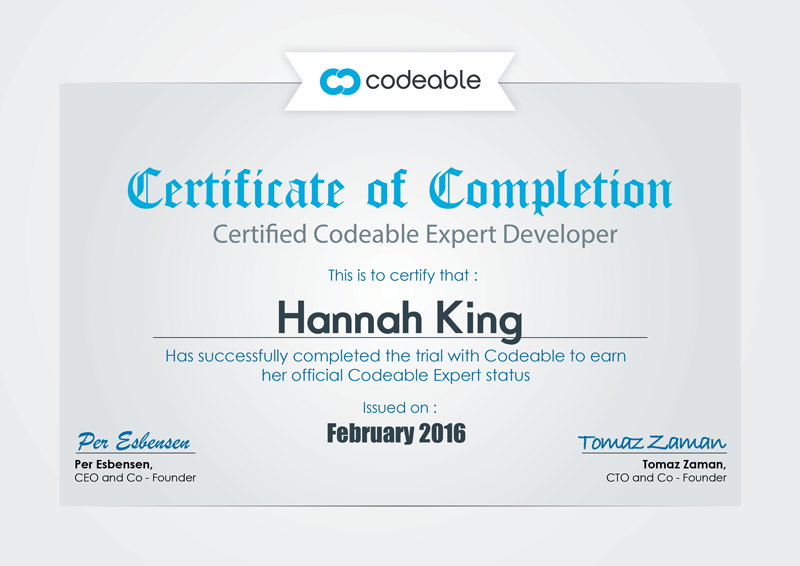 Hannah was the developer I have been searching for! I highly recommend her for any tasks that involve ET Divi or WooThemes Sensei! Thank You Hannah!! Hannah came to rescue again as we we're having issues with the check out page and the next business day it was working. Can't say enough about her service and knowledge! Once again, Hannah King took care of our problem and the next day everything was working great with the error message resolved over the holiday weekend. She was prompt and courteous as well as knowledgable about how to fix the issue - making us happy campers! She is fantastic at what she does. I am 100% satisfied. Hannah is prompt, professional and knowledgeable in her area. Highly recommended! More awesome work from Hannah. Professional, easy to work with, no fuss. Love it! Hannah is fantastic! It is rare to find such technical skills along with great taste and design abilities. As part of the job we asked Hannah to deal with a technical component she was not familiar with. She managed to overcome many obstacles quickly without the help of the component's technical support. Hannah showed an impressive work ethic. She was very responsive, showed responsibility beyond her scope, and in general she was a pleasure to work with. From now on, she is our go to person with any matter regarding our website. Hannah was very patient with all my questions on customizing my Wordpress template and she did fast clean work. She worked very diligently to ensure the best solution was reached, regardless of my requests or any obstacles with the templates. She is a true professional and I will definitely be working with her again. I would highly recommend Hannah.